The AUTOPULSE® 542R is a six zone FACP for single and dual hazard agent releasing applications. 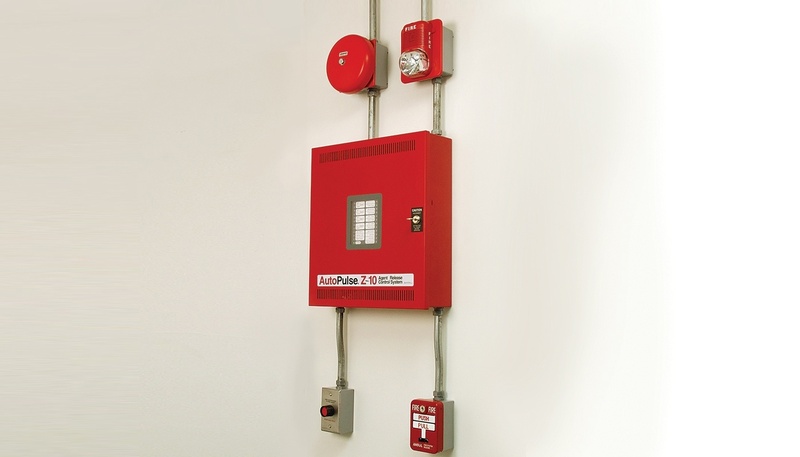 The AUTOPULSE 542R provides reliable fire detection, signaling and protection for commercial, industrial and institutional buildings requiring agent-based releasing. The AUTOPULSE 542R is compatible with System Sensor’s i3 detectors which are conventional smoke detectors that can transmit a maintenance trouble signal to the FACP indicating the need for cleaning and a supervisory ‘freeze’ signal when the ambient temperature falls below the detector rating of approximately 45 °F (7.22 °C). In addition, the control panel is compatible with conventional input devices such as two-wire smoke detectors, four-wire smoke detectors, pull stations, waterflow devices, tamper switches and other normally-open contact devices. Refer to Device Compatibility Document for a complete listing of compatible devices.Four outputs are programmable as NACs (Notification Appliance Circuits) or releasing circuits. Three programmable Form-C relays (factory programmed for Alarm, Trouble and Supervisory) and 24 VDC special application resettable and non-resettable power outputs are also included on the main circuit board. The AUTOPULSE 542R supervises all wiring, AC voltage, battery charger and battery level. Activation of a compatible smoke detector or any normally open fire alarm initiating device will activate audible and visual signaling devices, illuminate an indicator, display alarm information on the panel’s LCD, sound the piezo sounder at the FACP, activate the FACP alarm relay and operate an optional module used to notify a remote station or initiate an auxiliary control function.The AUTOPULSE 542R(E) releasing panel offers the same features as the AUTOPULSE 542R but allows connection to 220/240 VAC. Unless otherwise specified, the information in this data sheet applies to both the 110/120 VAC and 220/240 VAC versions of the panels. The AUTOPULSE® IQ-318 intelligent Fire Alarm Control Panel is part of the AUTOPULSE Series of Fire Alarm Controls from ANSUL®. Designed with modularity and for ease of system planning, the AUTOPULSE IQ-318 can be configured with just a few devices for small building applications, or for a large campus or high-rise application. Simply add additional peripheral equipment to suit the application.